Jump4Heroes BASE Jumping in our Phoenix Fly Vampire 3 wing suits from the north face of the Eiger in Switzerland to raise money and awareness for The Royal British Legion and Help For Heroes. 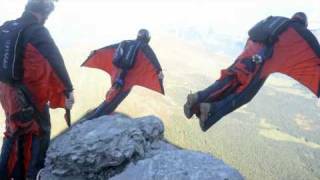 Repeat Jump4Heroes BASE Jumping The Eiger ... Choose your time range using the slider. Red Bull, Wingsuit-Proximity- "Extreme Jump"